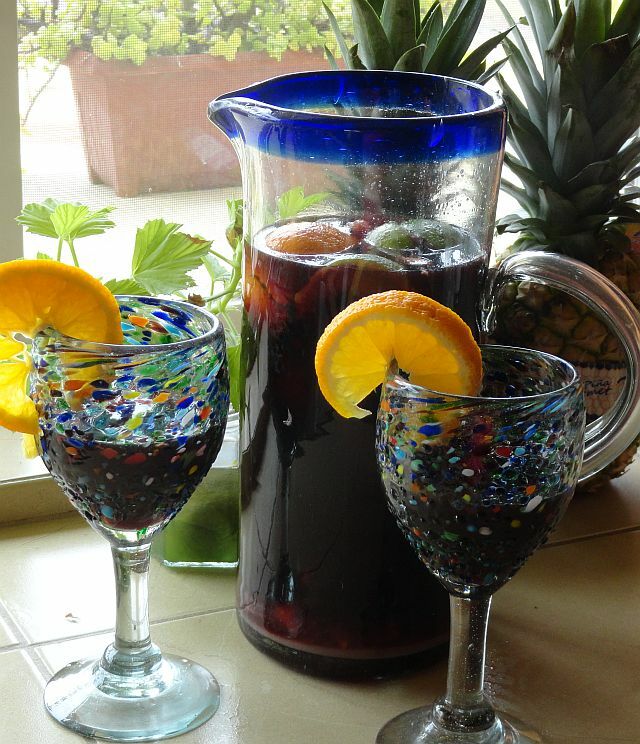 Sangria, is a wine and fruit punch originating from Spain and Portugal. Back in the seventies in the US it was THE drink to serve with your fondue, and to be enjoyed along with other mood altering substances popular at the time by candlelight while sitting on the floor with incense burning. Peace and Love, baby, it’s a new century. The hippies of yesteryear are the grandparents of today. But we are not doddering, well most of us are not, and we still love a crackling cold drink with a buzz of booze. Made with red wine the name sangria is closely related to the Spanish word, sangre or blood. Blood is red, get it? 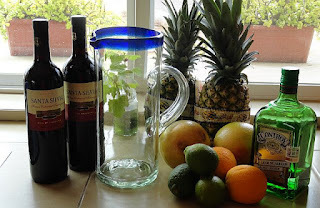 Since citrus fruits and berries and some kind of carbonation are essential to a good sangria, excellent wine is not. Some jug wine (remember that phrase?) that fits your budget is all you need. It’s getting hot here in La Paz. And I invited a bunch of women to come for a swim and to bring food. It’s a great scam, I have the pool, they bring the food. So I decided to make sangria for the bathing beauties. They all arrived in cute beach cover-ups. And none of them sew. And who was wrapped in a towel? Moi! Yo! Me! 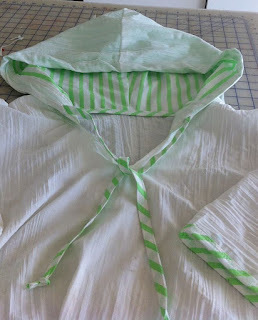 I vowed by the next pool party I would have a cute cover-up and now I do. Here it is. The white fabric is the lightest, softest crinkle cotton, it feels wonderful,. 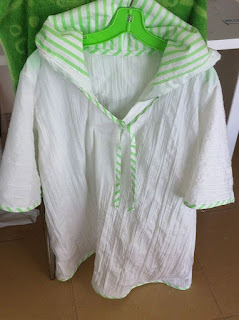 I love the feeling of dropping my suit, right outside on the patio and toweling off, if the Baja sun has not dried me almost immediately, then pulling this over my head an letting it glide down and lightly rest on my shoulders. I lined the hood and made my own seam binding o perk up the look. I love stripes, don’t they just scream summer and beach to you? It was a little bit of a trial working with a tightly woven cotton and this fluffy light crinkle cotton in tandem. But I kept focused on the finished result and the fact that my friends would be driving up to the door any minute. And I love hearing them exclaim: ” you made that? You made that this morning? And you made the sangria? Luckily I made the sangria BEFORE I made the cover-up. I used Fresca you can use anything from plain mineral water to any flavor carbonated water or citrus soda. Fruit: 2 limes, 2 oranges,1 grapefruit, fresh or frozen strawberries. I use frozen so they act as ice cubes and do not dilute the brew. I am not a scientific cook, I splash, dash, and dump ingredients. So use as many strawberries as fit in the pitcher or look good to you. ½ pineapple (Pina Miel) or you can use canned pineapple chunks and the juice. 2 tablespoons of sugar or a dash of simple syrup. See simple syrup recipe below. Get a big pitcher that can hold two bottles of wine. Pour in the wine. Or two smaller pitchers and put half the ingredients in each. 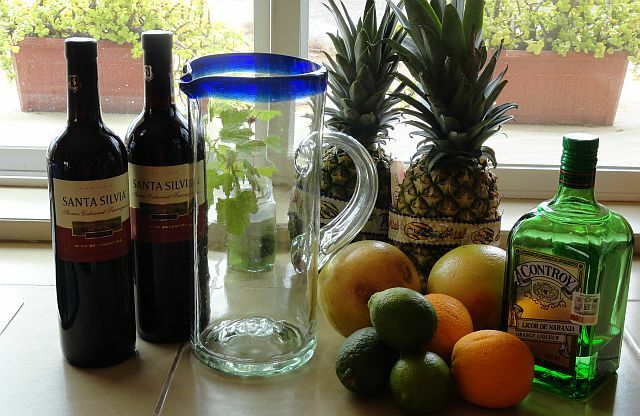 Squeeze the juice of the two limes, two oranges and one grapefruit into the wine. Remove the seeds first! Then dump the squeezed fruit in the pitcher. Cover the pitcher and refrigerate. Just prior to serving add the carbonation. This is where the fun begins, add the flavored carbonation to suit your taste. Warning: Taste with a spoon, don’t get sloshed while preparing the sangria. Otherwise you may be a bit wobbly on your pretty flowered flip-flops with a tiny heel and drop the pitcher in the pool . Add the frozen strawberries. Remember they act as ice cubes so let them plop into the glass as you pour. Garnish the glasses with a lime or orange slice or even a paper umbrella. 1 cup of sugar and one cup of water, boil till sugar dissolves. Let cool. Sweeten the sangria to taste.